It’s the International Year of the Family ! It’s the international year of the family. I know, or rather I didn’t know that until now. I do know that there are international food days and don’t really pay much attention to that but hey look! Year of the family sounds nice and aww, non? It’s by National Day Parade 2014 and MSF and from 5 May to 16 June 2014, everyone can submit a Big-Hearted Story of a person or family that has made a difference in their lives. Ok kind of too late for you readers who just read this post for the story part now but do read on. This year, IYF seeks to encourage big-heartedness within the community. It hopes for everyone to share the warmth of their family with others around them. As such, through the Awards, members of the public will have a great opportunity to express their heartfelt thanks to those who have made a difference in their world! We would like to invite you to support IYF by taking part in the Awards and saying thanks to a special someone in this meaningful way! It could be a neighbour, colleague’s family, volunteer, teacher, friend, or even a stranger! It might be too late for you to join the contest at the Big Hearted Family Awards website. ACTUALLY, it isn’t if you’re reading this in the morning. DEADLINE is before midnight 16 June (11.59pm) so just from the heart, I am sure the words will come out for you to say and nominate special someone/ family for the Big-Hearted Family Awards. Nominate them and you might win NDP preview/actual day tickets too! Remember, family doesn’t have to be blood related, it’s who you deem family or someone special to you. You can also check out Care & Share , info which you can also help out in the community in Singapore. Yes. I know such aww togetherness and whatnot. You can donate or volunteer your services to various communities from there if you don’t know how to start. You do realize, that not all volunteerism means going to an old folk’s place and cleaning or whatever right? You can contribute what skills you have to various groups that you want to help out. That’s how it all starts in also being ‘special’ to others. I help out in the cat side with Love Kuching by making videos and sometimes taking pictures which helps publicize the group and thus is also caring for the community. Need an example for how to nominate someone? Well, I would write a bit about my parents. It’s not ONE someone but ehh, since it’s my blog I can write it. NYER HUR HUR. I know, that’s kind of like a cheatcode. But yeah, I can’t choose. They’re both inspiring and in the medical line too. No, not as doctors but as the support who also work with patients or health care workers. 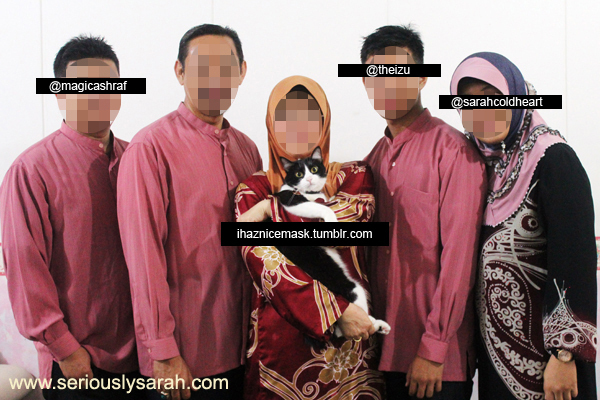 Amidst all that, they also care for the family… AKA MINE. Ok, maybe this isn’t a really awesome example of what to write in your nomination but really, they had been there always and are super caring. Sometimes if they see people on the streets needing help, like an elderly man not being able to stand up and lying on the street while others were just walking by (?!) they checked up on him and took him to the doctor and then to his home. Or staying with lost kids until their parents managed to find them. I don’t know, it might be also as simple as making sure that my grandparents are also ok and checking up on them too. Yeah, it takes time and energy and effort and they DO IT. Which is totally inspiring. Anyway, go nominate someone special to you in Big Hearted Family Awards!